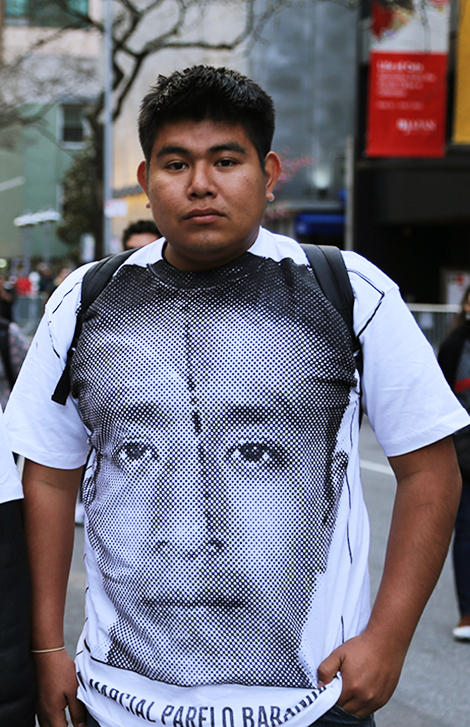 NEW YORK — Seven months to the day after watching two of his classmates get shot in the head and many more get taken away — never to be heard from again — Ángel Neri de la Cruz marched in New York to demand answers. He joined the grief-stricken relatives of his missing classmates at the head of a protest on Sunday that began in Washington Square Park and culminated with a rally in front of the United Nations headquarters in midtown Manhattan. 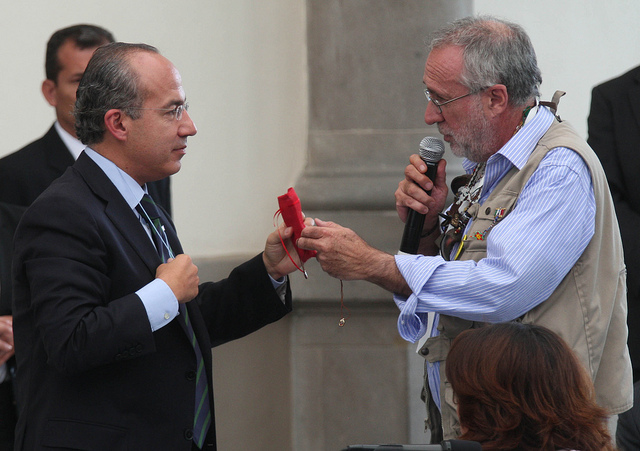 “I’m here to talk to people about the truth and reality of what is happening in Mexico,” Neri told LAND. 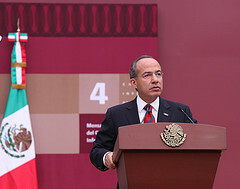 He spoke of the widespread corruption among Mexico’s governing classes and the culture of impunity that allowed policemen to injure or kill civilians with little oversight or accountability. Neri, 19, was one of the few survivors of a deadly attack on teacher-trainee students in Iguala, in the Mexican state of Guerrero, on Sept. 26, which left six dead, 26 injured and 43 missing. He traveled to the United States with family members of the missing in an effort to re-ignite the search for the students. Ángel Neri de la Cruz survived the massacre which left six of his fellow students dead and 43 missing. Sunday’s rally in New York coincided with demonstrations in Baltimore over the death of 25-year-old Freddie Gray, an African-American man who died on April 19 in police custody after a spinal cord injury that he incurred during or prior to his arrest did not receive immediate medical attention. 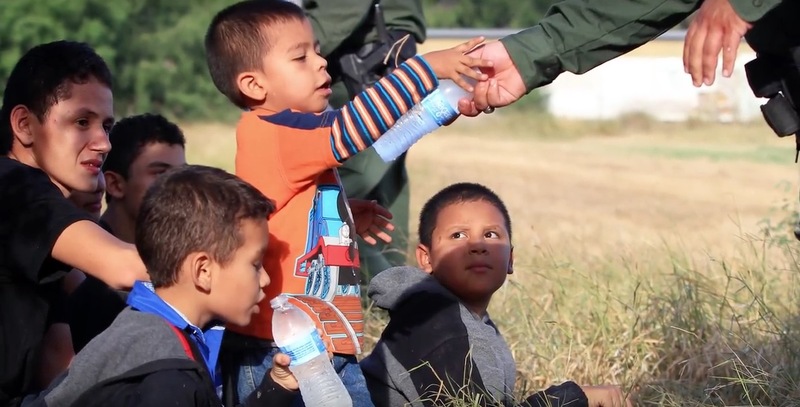 Americans and Mexicans have reacted with shock and horror to incidents over the last year that, in each country, have come to symbolize a deadly chasm between the rule of law and the citizens it is meant to protect. 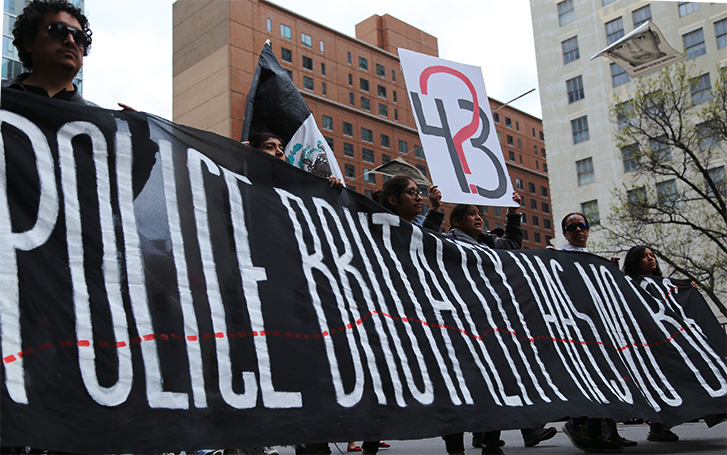 On Sunday, Mexican and American representatives of the individual struggles north and south of the border marched side-by-side to demand an end to police brutality. 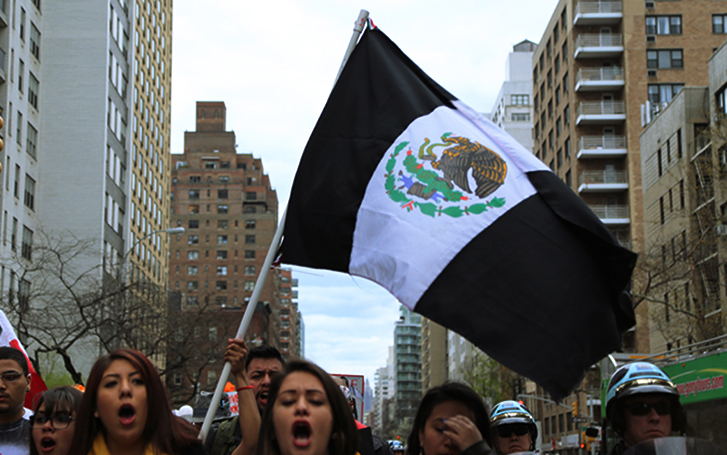 Magda Aguirre, from Guerrero, Mexico, carries a modified Mexican flag. 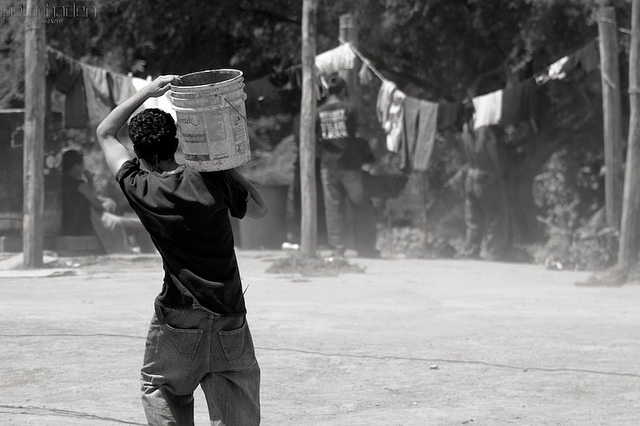 In Mexico, the barbarity that greeted the planned act of civil disobedience by college students from a poor, rural area exposed a nefarious web of politicians, police chiefs and cartel leaders who operated the state of Guerrero as a private fiefdom. The tragedy garnered international attention as the search for the students in neighboring areas turned up a seemingly inexhaustible number of mass graves. In the United States, the deaths of unarmed men and women of color at the hands of law enforcement agents — from Michael Brown in Missouri to Miriam Carey in Washington, D.C. to Walter Scott in South Carolina and, most recently, Freddie Gray in Maryland — have stirred a national debate over the targeting of African-American individuals by police, and galvanized the civil rights movement Black Lives Matter. “Just as much as Black Lives Matter, it’s only right that we support other groups being marginalized,” a young protester, who identified himself as Prince Akeem at Sunday’s rally, told LAND. 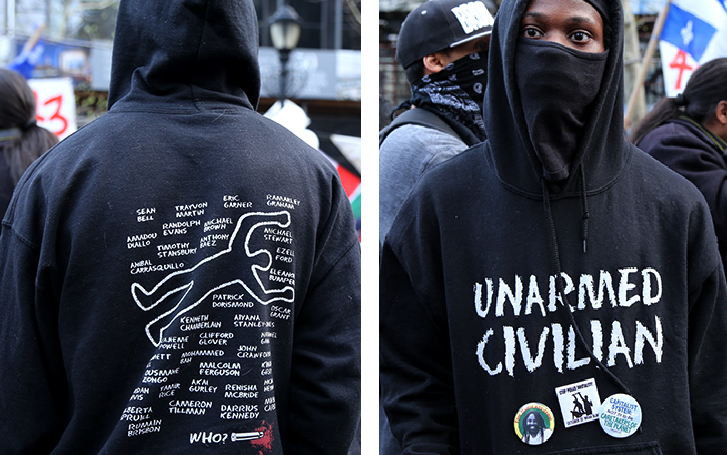 Akeem wore a sweatshirt with the words “Unarmed Civilian” written on the front, and the names of African-Americans killed by armed citizens or police officers on the back. A protester going by the moniker Prince Akeem attended the closing Caravana 43 event in New York City on Sunday. 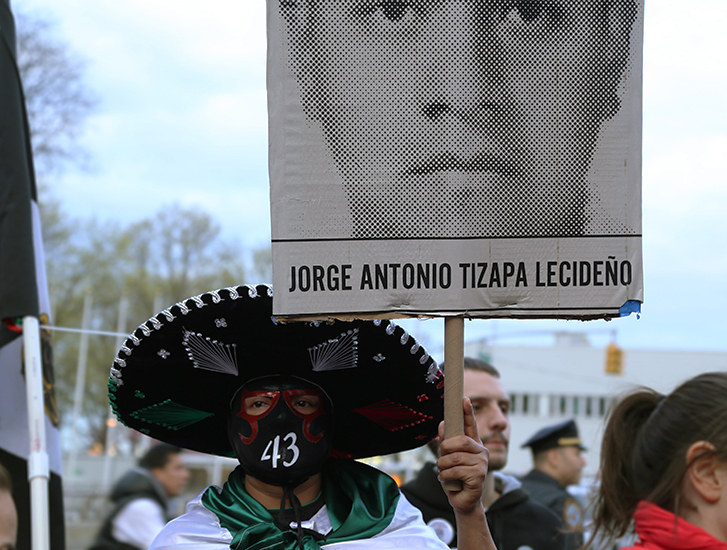 A masked protester holds a sign with the name and face of one of the 43 disappeared. For nearly one hundred years, schools like the Raúl Isidro Burgos Rural Teachers’ College in Ayotzinapa have offered a path out of poverty for politically engaged teenagers in rural areas of Mexico. While originally established under a program to improve literacy levels in rural communities, the teachers’ colleges (of which only 16 of the original 59 remain) have since evolved into bastions of leftist activism and political dissent. Students frequently organize protests and commandeer public buses to use as transportation to and from rallies. The Sept. 26 clash with municipal police occurred during the fundraising stage of one such action. As Neri recounted to a packed room at the California State University, Northridge, in March, he and other students evaded the slaughter, and later found one of the buses covered in bullet holes and blood. The two friends Neri witnessed getting shot in the head survived, according to classmates. 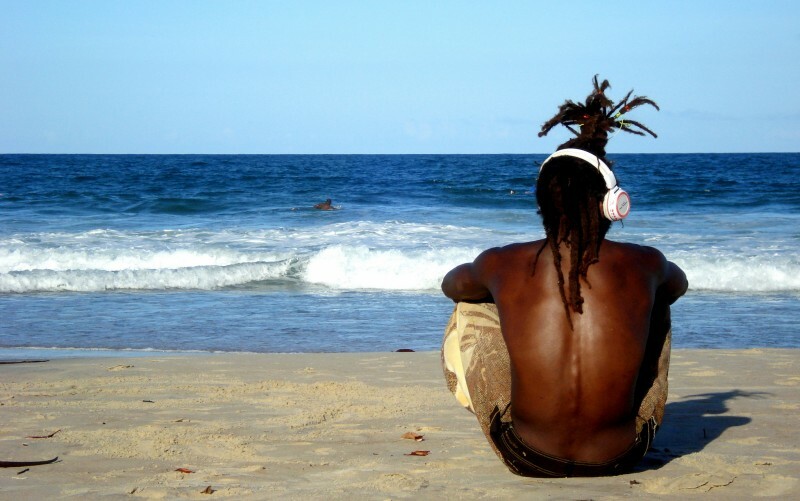 Neri remembers that one of them, having been shot in the mouth, typed ‘Get me out of here because I’m dying’ in Spanish into his phone, “Because he wasn’t able to talk,” as he related to Reuters shortly after the attack. 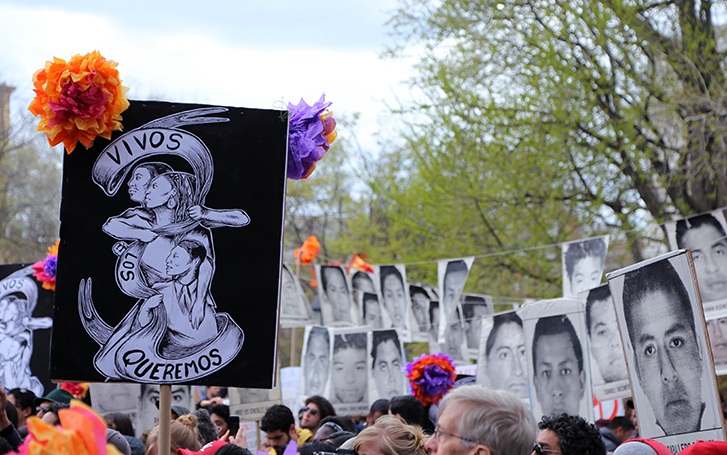 The survivors’ and relatives’ tour across the United States — dubbed Caravana 43 — comprised an effort to pressure the Mexican government into re-investigating the students’ kidnapping, and to raise awareness of the 20,000 who have disappeared in recent years at the hands of both the armed forces and criminal gangs. So far, the mayor and first lady of Iguala have been arrested over their alleged role in planning the attack, as have at least 58 police officers, including a deputy police chief in Guerrero state. The Iguala police chief remains at large. 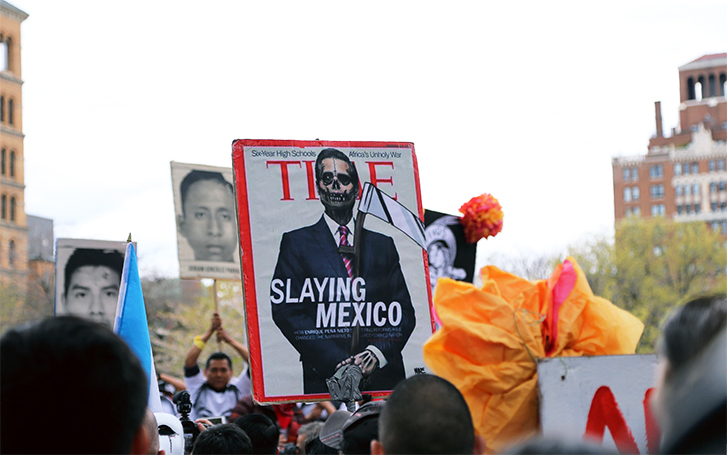 The crisis upended President Enrique Peña Nieto’s administration, toppling his reputation among foreign allies as ‘Mexico’s savior,’ and causing his approval ratings to nosedive. Authorities closed the investigation in November, concluding that the police handed the students over to a local cartel, who in turn killed them and incinerated their remains in a nearby garbage dump. 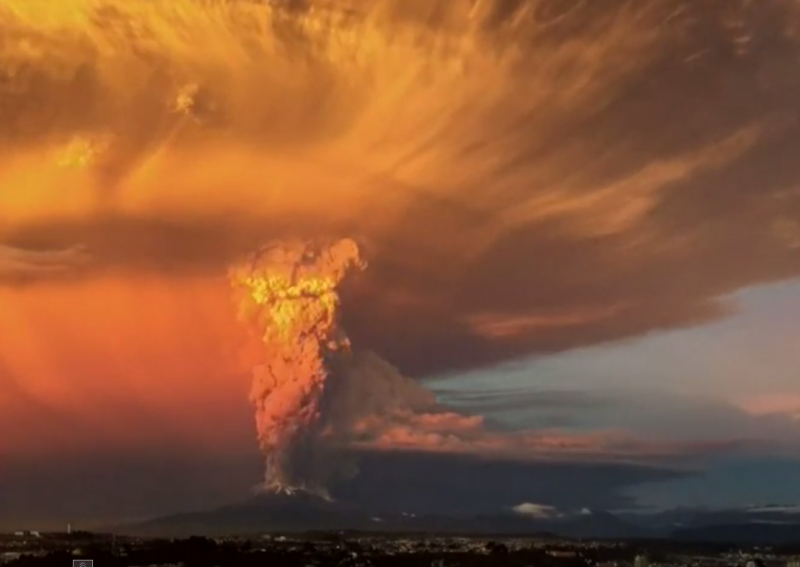 Nevertheless, experts have cast doubt over the official government narrative. The relatives of the missing students hope — and demand — that they be returned alive. 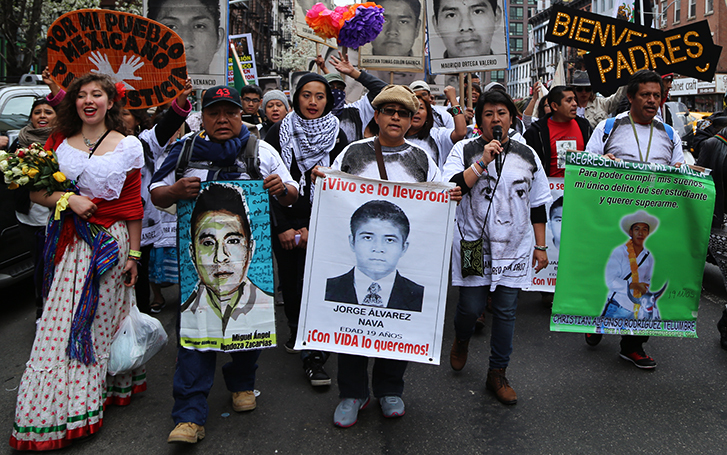 A sign carried during Sunday’s rally in New York reads, in Spanish, “We want them back alive.” In the background, the faces of the 43 missing students. “The parents coming here and putting a face to what has been happening in Guerrero has brought enormous awareness,” Annabel Paez, a member of the Mexican-Central American collective Cetiliztli Nauhcampa Quetzalcoatl In Ixachitlan, told LAND during Sunday’s demonstration. Ultimately, the evening’s most heart-rending cry may have been its most simple: a slow, steady count from one to 43. Estanislao Mendoza Chocolate, second from left, holds a painted portrait of his missing son, Miguel Ángel Mendoza Zacarias. 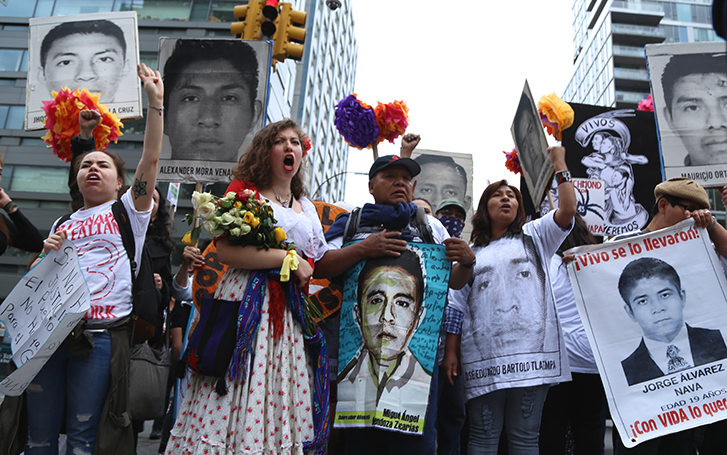 To Mendoza’s right, Blanca Luz Nava Vélez carries a poster with a photo of her son, Jorge Álvaréz Nava, and the words (in Spanish), “They were alive when taken. We want them back alive.” Anayeli Guerrero de la Cruz, the sister of Jhoshivani Guerrero de la Cruz, speaks into the microphone, second to right. On the far left, Clemente Rodríguez Moreno holds a poster of his son, Christian Alfonso Rodríguez Telumbre.